Ever since I first discovered the spiritual significance of the shamrock and the great role that St. Patrick played in the spread of Christianity, I have made it a great point to celebrate St. Patrick's Day. Of course, we have always celebrated the leprechauns, luck, and what not to some degree, but now we really use this as another teaching tool to help our children learn about our God. 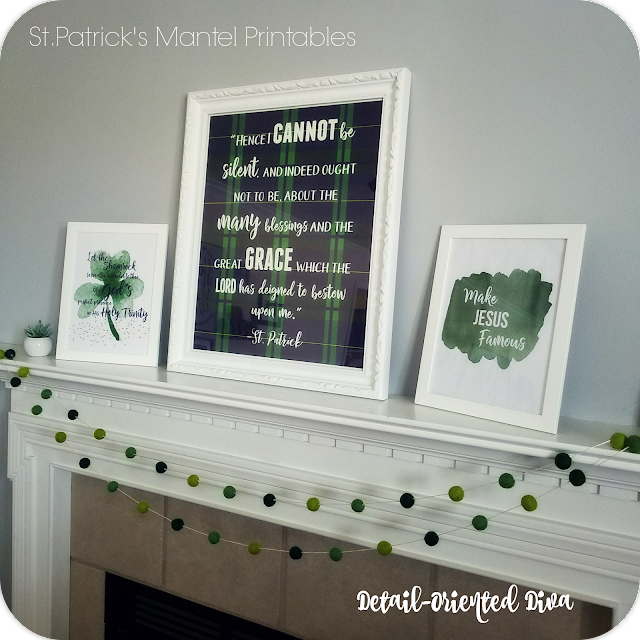 "The shamrock is a symbol both for the Holy Trinity and St. Patrick (389-461). The shamrock is a clover plant with a yellow flower and leaflets made up of a stem with three small green leaves. The plant is very common and widely distributed throughout Ireland. There are several popular legends about how St. Patrick used the shamrock to explain the mystery of the Trinity. According to one story, St. Patrick went to Connaught where he met two of King Laoghaire’s daughters, Ethne and Fedelm. St. Patrick had been unable to persuade the king to convert, but he convinced the king’s daughters. 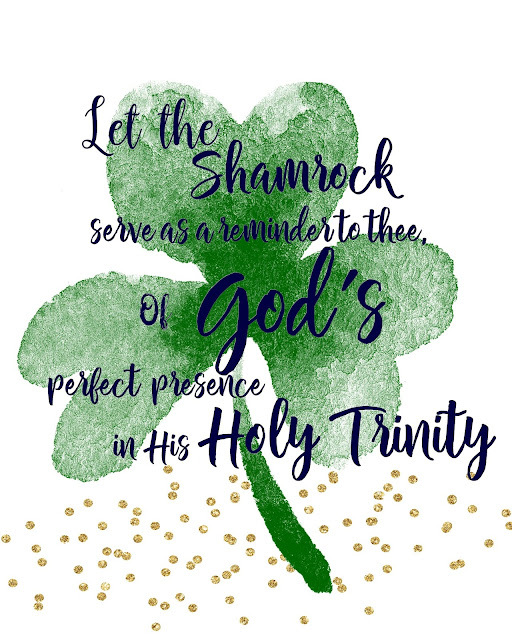 During their time of instruction, St. Patrick used a shamrock to visualize the mystery of the Trinity, how a single plant with three leaves is analogous to the one Triune God with three separate and distinct Persons (Thurston, H. J., ed., Butler’s Lives of the Saints, Vol. 1, 615). 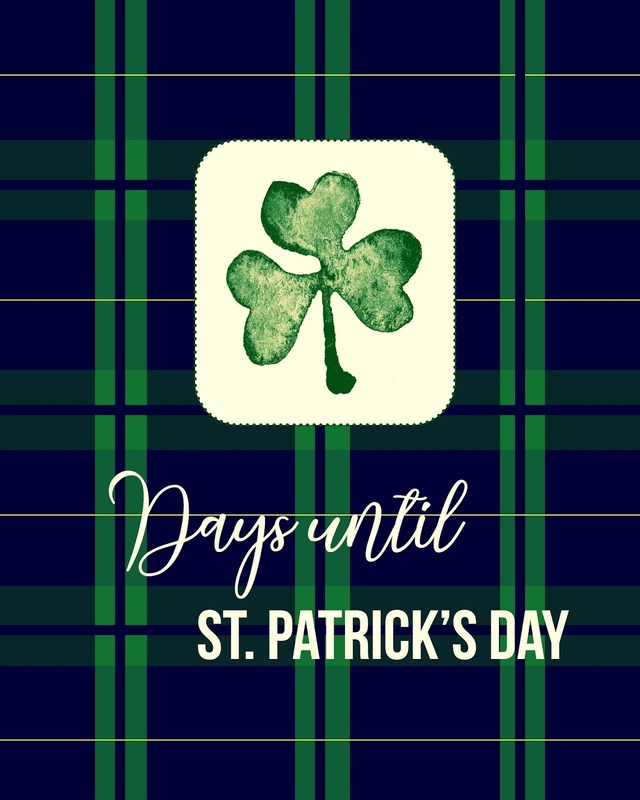 According to another legend, St. Patrick used a shamrock to help explain the Trinity in a sermon he preached directly to King Laoghaire. According to a third legend, St. Patrick was traveling and happened upon a number of Irish chieftains along a meadow. 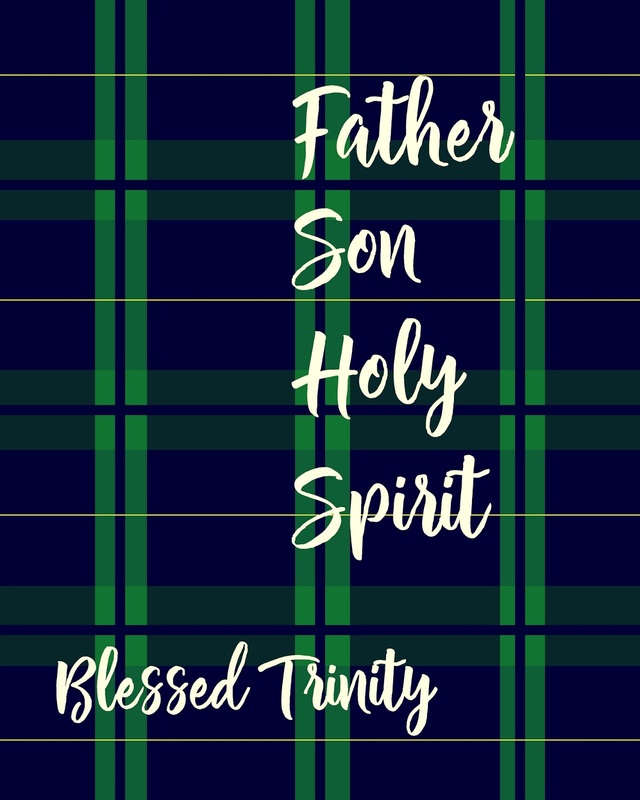 The tribal leaders were curious about the Trinity and asked St. Patrick for an explanation. 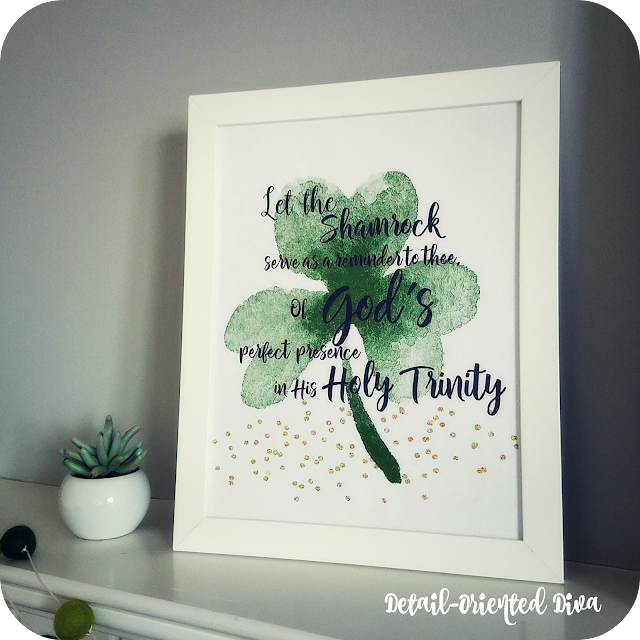 So he bent down, picked a shamrock, and showed it to them, and explained how the three leaves are part of the one plant, and how similarly the three Persons, Father, Son, and Spirit, are part of one Supreme Being". I have created these printables to grace our mantel and serve as daily reminders of God's presence. 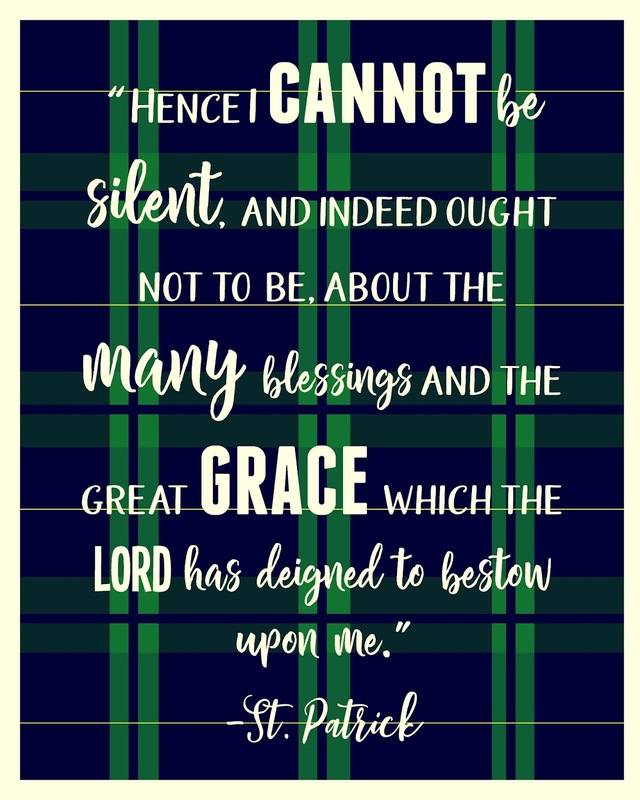 I especially love this quote from St. Patrick:" Hence I cannot be silent, and indeed not ought to be, about the many blessings and the great grace which the Lord has deigned to bestow upon me". AMEN! Printable links for subscribers under each picture. Please click on my "How to Print" page if you have any questions about how to download and print. 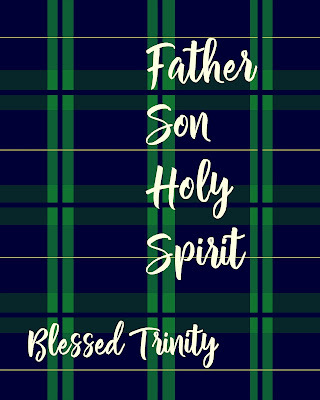 And yes, I realize Tartan plaid is more Scottish than Irish, but it's just so pretty! And yes, I realize that tomorrow is Valentine's Day and I already have St. Patrick's Day stuff everywhere, but Easter is on April first this year y'all! (This is meant to be framed behind glass or plastic. You fill in the number of days with a dry-erase marker). 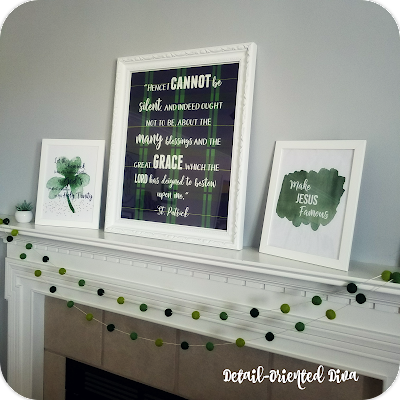 This post St. Patrick's Printables appeared first at Detail-Oriented Diva.